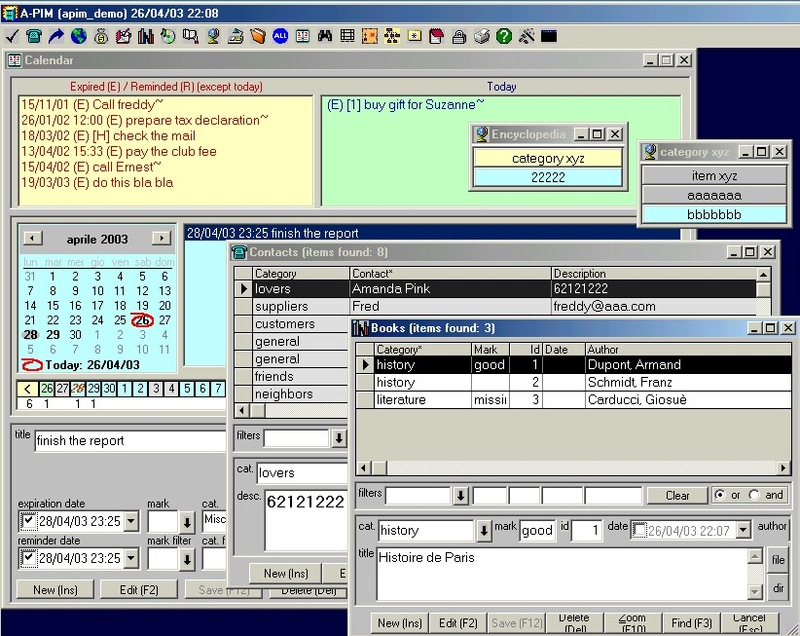 All-in-1 Personal Information Manager can display stored information not only as a grid or list, but also as a calendar, a tree map, and a tag map, complete with auto-tiling, drag and drop, and various ways to find the information stored in the database. An enhanced version of All-in-1 Personal Information Manager including an image viewer/editor and tools for reflection, mind stimulation and self improvement is available under the name of All-in-1 Personal Information Manager. All-in-1 Personal Information Manager is compatible with all Windows versions. All data are stored in a Microsoft Access 2000 database and can also be manipulated with Microsoft Access 2000; user can select the database to work with. Installation of Access 2000 is not required. 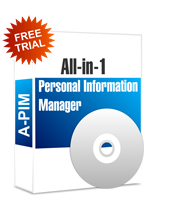 A-PIM (All-in-1 Personal Information Manager) can be used without registration for 30 days from installation. Registration fee is 15 US$. Payment can be done through PayPal, a secure, independent Internet payment service provider. Shortly after your payment has been received by Paypal, you will receive a registration key which will allow you to use the program without limitations and without registration reminders. In 90% of cases you will receive your registration key within 12 hours. NOTE: due to the fact that A-PIM is just a simplified version of APO (lacking image viewer and mind stimulating functions) the list includes testimonials applying to both products. able to use All-In-1 to organize even my free form notes and thoughts. The color coding helps as does the versitility and depth of the cross-referencing. 15^041031.9) F: Error 52 when running an item with a file path including a '*' character. 14^041031.8) F: In Tree View, refresh of current item after chanhe from other window did not work. 13^041031.7) F: In Calendar, error 94 when saving an item without expiration date. 12^041031.6) F: In Calendar, error 388 when clicking on an empty subwindow. 10^041031.4) F: In Calendar, error 388 in rare situations using the lists context menus. 09^041031.3) F: In Tree View, error 94 if you double click on an item with null content. 08^041031.2) F: Previous correction was incomplete. 07^041031.1) F: If program is minimized and autolock active, error when autolock timer expires. 06^040404.6) F: In calendar lists, with long lists the selection of an item in a list was not precise. 05^040404.5) I: In Synchronization, message with differences shows up to 511 characters (previously 255). 04^040404.4) I: When printing items from the Journal, show also the date. 03^040404.3) I: Improved installation program.